For one to be a true Bostonian, you have to partake in some of the city’s great pastimes. Catching a game at Fenway, relying on but still bemoaning the T, and trying to get a table at Toro are just a few. However, lately, so is chiding the Seaport District as the black sheep of the otherwise gleaming gem of a city. “[It] has all the charm of a suburban Dallas office park,” hissed the Boston Globe last year with many readers nodding in wholehearted agreement. Sure, it’s easy to throw barbs at the new kid on the block from a sea of parking lots and dilapidated warehouses. Yet, any true lover of this city can see it’s not about fitting in with the rest of the historic Hub; rather, it’s a new addition to the house—and one that is vividly showing where this city is going. Technically a part of South Boston, the neighborhood began its modern incarnation in the 90s. Our buildings may not be the tallest or prettiest girls at the party thanks to being in the flight pattern of Logan Airport; however, city life is made at street level, and ours is vibrant and only getting better. Start your day by waking up overlooking Boston Harbor and wander to sunrise yoga at Fan Pier Park. After you say, “Namaste,” note just how increasingly international the city is becoming as a morning flight to London roars up, up, and away from the airport across the water just as one touches down from Dubai. Work could be at any of the office towers that seem to be going up daily in the area. Start-ups, pharmaceutical companies, and financial firms are just a few of those that are flocking to the neighborhood, but, let’s get real—the true fun happens once the clock strikes 5. While not technically Happy Hour (old Boston laws still apply to us new, spring chickens), it’s certainly a thriving scene of post-work revelry across the neighborhood in places like Liberty Wharf. Dine in some of the best new restaurants in the city (even out-of-towners like Mario Batali are setting up shop) or head to the nearly 100-year-old No Name Restaurant for a slice of nostalgia on Boston’s Fish Pier. Catch some of the hottest musical acts at Blue Hills Bank Pavilion, and, if you’re still standing, head across the neighborhood for a nightcap at the most interesting bar in town: Barbara Lynch’s subterranean Drink (technically a step out of the Seaport in neighboring Fort Point, but we’ll let you cheat…just this once). This is merely the status quo. What’s on our horizon—beyond a myriad of cranes, that is—is both groundbreaking and record-setting. 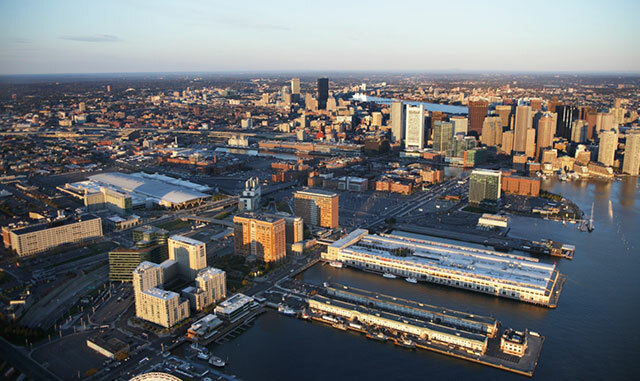 The Boston Marine Industrial Park is currently in the bidding process to enhance industrial space while also adding a potential Boston version of Pike Place Market. Nearby Seaport Square was the largest land sale in city history in 2006 and has since seen over $665 million in part and parcel deals. The plans for its 6.3 million square feet of mixed-use buildings made a few of our original naysayers deliver approval. “Style and utility can coexist on the South Boston Waterfront,” claimed Boston Magazine after the project revealed a new design of towers inspired by Back Bay row houses—effectively looking to the city’s past for inspiration in its future. If you head north on L Street in Southie past the eponymously-named tavern of Good Will Hunting fame and a few other local establishments, you eventually slip into the Seaport. Just beyond where L becomes Summer Street, the Queen Mary 2 might be docked for the weekend along with a few other ships heading to the Caribbean. Keep going down the road and venture onto the Lawn on D where locals and visitors for some event du jour at the Boston Convention and Exhibition Center mingle over beers and lawn games. If this isn’t your speed, head across the neighborhood to the iconic Institute for Contemporary Art for the latest exhibition. Maybe even pop down Northern Avenue to the Barking Crab and try an oyster shooter while looking across Fort Point Channel to the beautiful downtown skyline. The papers may claim there is no culture in our neck of the woods, but take a look around. We’re certain you’re going to fall in love with the place. If you don’t, come back tomorrow. There’s bound to be something new open by then.